It's no wonder that animals are experiencing zoochosis -- they are not only held captive, they're now being forced into the fashion world. The big cats and bears are being tasked with ripping denim to benefit the Kamine Zoo in Hitachi, Japan. Supporters of the zoo have teamed up with Zoo Jeans, a brand described as "the only jeans on earth designed by dangerous animals." 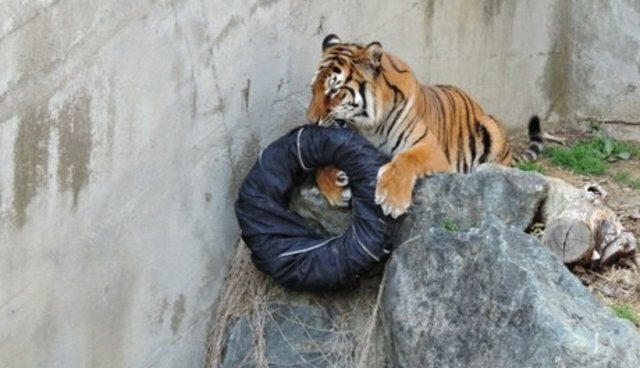 Sheets of material are attached to tires and big rubber balls that are then placed in enclosures with lions, tigers and bears. The animals then tear through the denim fabric creating super fierce rips. The zoo will auction off three pairs of "animal-designed" jeans at the end of the month to fund a renovation. Seems like a good time to support a more animal-friendly designer, like John Bartlett or Stella McCartney.